What do you need to complete your application? Follow this handy-dandy flowchart-style checklist! Just click on the links in each question/prompt to skip to a section that pertains to your needs. You can always navigate back here by clicking on links to go “Back to Checklist” or hitting the back button on your browser. Note, this sometimes breaks on Safari browsers. So let’s begin – are you applying as a Lead or a Partner Organization on a proposal to the Hive Fund RFP? Is your organization taking full responsibility for disbursing funds to all partners on this project? Yes or No? Answer Yes if you will be the only organization receiving a check from the Trust. Answer No if any of your project partners will be receiving direct payments from the Trust as Funded Partners. Complete and submit a full application for the project on Grant Central. Please note that in most cases the Trust prefers that all partners who are eligible to be funded directly submit individual proposals to address the participants, evaluation, and capacity questions noted above and create a record of payment with the Trust. Unfunded Partner – you will not be receiving any funds for this project. Sub-granted Partner – you will be receiving funds dispersed to you by the project lead organization. Funded Partner – you will be receiving direct payment from the Trust. Contact information, bios, and resumes for key staff on the project. Budget – you will need to complete the budget indicating your organization’s requested share of the funding. Please see the Budget Play by Play for details. Participant profile – this can be an aggregate profile for the project (duplicated from lead) or a unique profile for your organization’s participants, depending on the structure of the project collaboration. Evaluation plan – this should ideally be a shared evaluation plan (duplicated from lead); however, individual partners can identify unique outcomes. In addition, lead organizations must also complete detailed questions about the overall project scope that include a project description, a learner experience narrative, information on learning outcomes, connections to Hive Network goals, moonshots and priorities, and other relevant information that describes the value and impact of the project. So, that budget table. Don’t worry, here’s how we tackle it. The budget table has two sections: “Revenue” and “Expenses.” The way you win this game is to make the revenue equal to the expenses, or vice-versa. Since it’s arbitrary, we’ll start with Expenses and end with Revenue. Also, it’s good to note now that there is a 10% maximum policy for indirect costs calculated from the total amount requested from the Fund. The Fund also supports reasonable technology equipment requests that do not exceed 15% of the total amount requested from the Fund. Before we talk about the math, it’s helpful to reference a visual of the table, which is shown below. The yellow circle is drawing attention to the Revenue section, which is described last in this play-by-play. Both the Revenue and Expenses section headings are slightly obscured. We will reference this image below throughout. The Expenses section is what you might traditionally call the “Budget.” It’s where you will list all the expected costs associated with this project, broken down by category. In the figure above you can see that these include Salary, Benefits, Equipment, etc. Note that payments any organization will be making to Sub-granted Partners is noted as a Contracted Services expense here. The total expenses for the project – broken down by category – should go under the left hand “Total” column. This is irrespective of what you will be requesting from Hive. It’s the true cost of the project. The specific amounts that will be covered by The Hive Fund should go in the right “Hive” column. In the example shown above, these are left blank but should be filled in for your application! Remember, regardless of if there are multiple funded partners in your project collaboration, each funded partner should submit identical budget numbers under the left hand “Total” column. Please note that the Fund has a 10% maximum policy for indirect costs calculated from the amount requested for the project. The Expenses section is pretty straightforward, but the Revenue section is a bit more challenging. First, there are two parts to revenue, “Requested” and “Committed.” Right off the bat, it’s important to note that the Total Requested Revenue will need to match the sum of the Total Expenses (also denoted as Total Expenses) at the time of submission, as is shown in the example above. The first row of the Revenue section is labeled as “Hive” by default, as is shown above. The Requested Revenue (i.e. the first column) of this row is the requested funds for your specific organization from the Hive Fund. Each partner applicant (including the lead organization) should indicate the specific amount being requested by their organization in their budget tables in the same place as well. In the example above, this organization is requesting $10,000 from The Hive Fund. The second column for the Hive row – the “Committed” amount – is left blank (Hive Fund advisers determine this upon proposal review). This is the amount the applicant organization will receive for the approved proposal. As in the first row, the “Committed” amount is again set to zero (left to The Hive Fund advisers to determine upon review). Finally, the rest of this section will be a list of any sources of non-Hive Fund revenue or funds allocated to this project from any other new or existing grants, institutional commitments, or in-kind donations (i.e. cash equivalent). You will make this list by adding as many additional rows as necessary. This is a fundamental requirement for the match in Embark and Catalyst grants, but projects submitting to other grant categories may want to report this information as evidence for future sustainability or broader impact. In the example above, there is one additional source of revenue, a matching grant from the McCormick Foundation for $50,000. The sum of the Total Expenses column (the Total Expenses) and the sum of the Revenue Requested column (the Total Revenue) must be equal to each other. Likewise, the sum of the Hive Expenses and the sum of all Hive Requested Revenue lines should be equal to each other. Note that this calculation is not completed for you automatically and you should check the math. From the total amount requested for the project from the Fund, there is a 10% maximum policy for indirect costs. For example, if you’re requesting $20,000 for your project from the Fund, your line item for indirect costs can equal but not exceed $2,000. If the Revenue and Expenses on all of your project partner proposal application submissions are equal and match each other, both Total and Hive-specific, then home run, touchdown, goal, game, set, match, score, you win! You have completed this part of the application successfully. Now you’ve just got to nail the rest of it too. Yes, select Renewal and Ongoing in each section of GrantCentral. For example, if you previously had a Spark grant, but are now applying for a Catalyst grant. Yes, the Hive Fund does support tech equipment costs. However, the request cannot exceed 15% of the total amount requested from the Fund. Furthermore, the Hive Fund looks for projects that can be spreadable. If they require specialized equipment, or the latest, hottest, cutting edge stuff, then while the project might be exciting, connected, digital, etc. it is unlikely to easily spread and be equitably accessible. There is a reasonable expectation of institutional commitment (as a partner change agent) to the sustainability of Hive Fund projects. At the Embark and Catalyst levels, this is the purpose of imposing a financial match. In general, we consider baseline tech equipment as a a fixed cost institutional match – at any funding level. It is not a recurring or expendable cost like transportation, staff time, or supplies. This kind of request can address the spread goal and articulates at why your organization couldn’t otherwise be expected to make this equipment available: it is customized to a broader need or audience. If The Hive Fund deems a tech request unfundable, they will indicate so and work with Hive Network staff and other partners to identify a solution that preserves the integrity of the project or identifies a substitute solution. Matching funds are a measure of project sustainability and there are two ways of demonstrating this. One is to attract new grants or supports that demonstrate a broader appeal for this work and other funding agencies that wish to support it. Another is an institutional commitment to the work. Therefore, matching funds can come from new grants, but they can also come from institutional or organizational resources “reallocated” to the project. For example: staff time, operational funds, in-kind donations or reallocated revenue might be reported as a match. Key leaders are people from each partner organization who have applicable expertise and will be directly involved in carrying out the programmatic aspects of the project. The project director is a lead organization’s single main programmatic point of contact for the project in case we have any questions about the project itself (as opposed to a fiscal contact). The project director should also be named as a key leader. In the detailed question section in the lead application, list partner roles and contributions. Please be sure to designate which category partners fall into (i.e. funded, unfunded (receiving no money), and sub-granted (receiving a check from lead) and the amount of funding (if funded) partners are requesting. Some Hive Partner or Affiliate Members may not be listed due to Hive’s recent increased membership. Please consult the Hive Chicago Network directory or the Members Page in order to confirm the status of a Hive member organization. No, unfunded partners do not need to create an organizational profile on GrantCentral. However, we would like to know who they are. Please name the organization in your application. No, the only way to share and review each partner’s draft proposal is to e-mail it among the partners as a PDF. However, we recommend that you work collaboratively by drafting proposal responses in a shared document, like a Word file or Google Doc. This way responses can live and be edited outside of the application and easily shared amongst partners. To review your entire application, click Print at the upper right. Your completed application will be displayed in a new window for you to review, print or save to your computer by selecting Export as a PDF. All funded partners need a letter of agreement including the lead applicant organization. The Trust would like to see a short but meaningful statement of commitment from all partner organizations on a grant, whether Funded or Contracted . Like other parts of the application, the lead is responsible for ensuring that all organizations submit letters of agreements to them. Once submitted, lead applicants should upload each letter of agreement into the lead application. Please see the Back to Budget section. Each partner, including the lead, should submit the identical budget numbers under the “Total Expenses” section of the budget table; in other words, the aggregate budget for the entire project. The total expenses for the project in each category should go under the left hand “Total” column, the specific amount being requested for The Hive Fund to cover should go in the right hand “Hive” column. 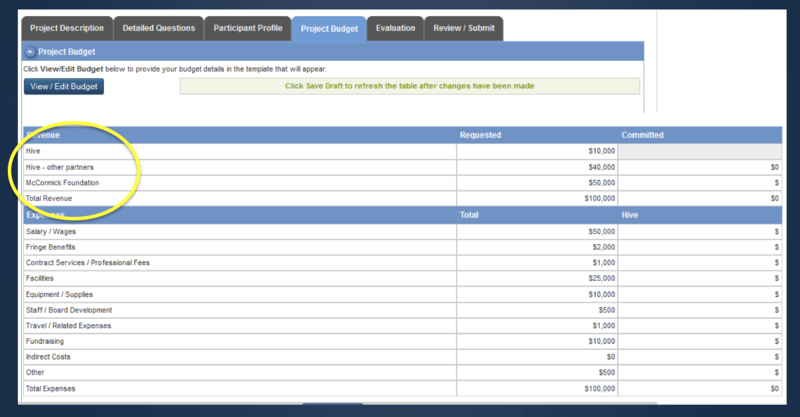 However, in order to identify the specific amount being requested from the Fund for each individual partner organization, each applicant (including the lead organization) should indicate that specific amount being requested by their organization in the first row of the “Revenue” section, labeled “Hive” by default under the first, “Requested” column. The “Committed” amount for that row is left blank. This is the amount your organization will receive if the proposal is approved. The sum-total of the rest of the requested revenue from Hive for all other partners should also be specified as a single aggregate number on an additional row, which you should label “Hive – other partners” in the “Requested” column. Again, in this case the “Committed” amount is set to zero. Finally, list (on as many additional lines as necessary) any sources of non-Hive revenue or funds allocated to this project from any other new or existing grants, institutional commitments, or in-kind donations (cash equivalent). This is a requirement for the Embark and Catalyst grants, but projects submitting to other grant categories may want to report this information as evidence for future sustainability or broader impact. If your organization (as the lead) will be managing all of the funds for the project and wish to be accountable for disbursement of those funds to your partners, then you are the only organization that must submit a proposal application. You would include the entire amount requested from Hive in the first row, labeled “Hive” under the “Requested” column of the “Revenue” section of the budget table, Row 2, Column 2. If your project partner organizations will be receiving individual payments from the Trust, then each organization needs to submit their own proposal, as partners, and specify their portion of the requested funds in the “Revenue” section of the budget table, the balance of the requested funds from Hive in a second row labeled “Hive – other partners” and the exact same numbers in every other row and column of the table. In this case, the same budgeting requirements hold for lead and partner organizations. Please see the question regarding partner budgets for more, extensive detail of consult the budget how-to section of this FAQ. Under the Project Description tab in the application it asks, “What is the organization’s capacity to manage this project?” Project description/capacity to manage the project relates to the each organization’s ability to manage its part of the project. If you are the lead organization, then this section would also describe your organization’s capacity to lead the overall project in addition to your own part of the project. If you are a partner organization, then you should focus on your organization’s capacity to manage your share of the project. You will address the outcomes for the overall project. As a result, all of the partners will likely submit identical answers to this section. However, if your organization will be playing a particularly unique role in this area, please feel free to elaborate. It is the profile for each partner’s participants. Each partner should describe their own participant profile in their own application. However, it may be necessary or make sense for some projects to use an aggregate participant profile for the overall project in each partner application, but we don’t expect that to be the case for every project. Use this space to be as precise as you can about the participants, where they come from, and who is drawing them in. Acknowledgements should be to “The Hive Chicago Fund for Connected Learning at The Chicago Community Trust” and when using logos, both The Trust and The Hive Chicago Network logos should be used. Please list the ways you anticipate or plan to provide acknowledgement and publicity under the “Acknowledgement / Publicity” section. There is a narrative field in the budget section for both lead and partner organizations. The narrative should apply to the project, and it would make things easier for all partners to submit the same information. You may add information specific to your role and how the funds would be used, but from a practical standpoint, you’d want to make sure that there are no inconsistencies in the information submitted by the various partners. From the total amount requested for the project from the Fund, there is a 10 percent maximum policy for indirect costs. For example, if you’re requesting $20,000 for your project from the Fund, your line item for indirect costs can equal but not exceed $2,000. You are expected to submit a workplan. Use this handy template. Q19 – If I’m applying to the Hive RFP Youth Digital Media Activism (YDMA) Grant Opportunity, do I have to be a Hive member or ally? For this special opportunity, we have opened up our process to include others like youth organizing entities. You do not have to be a Hive member or ally, but you must partner with a Hive member or ally in order to potentially receive funds. We ask that the Hive members lead the application proposal process. Q20 – What’s the total amount you can request for the YDMA opportunity? The total project-based support can be up to $10,000. The distribution of the amount should be decided by partners. Q21- What grant category do I select for the YDMA opportunity? Please select the “Spark” grant category. Please note that the regular Hive RFP requirements for the “Spark” level are not applicable to this opportunity. That being said, we do not expect project partners to create a whole new program for $10,000. This special opportunity can be seen to enhance existing work. The special opportunity is focused on redefining the notion of civics while potentially also building new capacity or raising awareness of the issues being highlighted. When writing the application, please explain how your proposed project will address this notion. Please also explicitly state that you’re applying for the YDMA special opportunity when writing the application. Q22- Do I have to complete the Intent to Apply form for the YDMA opportunity? Yes, the Intent to Apply form is required for the YDMA and regular Hive RFP.